Even in the dark, at least 50 percent of people can see the movement of their own hand, according to a new study using computerized eye-trackers. “Seeing in total darkness? According to the current understanding of natural vision, that just doesn’t happen,” says Duje Tadin, a professor of brain and cognitive sciences at the University of Rochester who led the investigation. Through five separate experiments involving 129 individuals, the authors found that this eerie ability to see our hand in the dark suggests that our brain combines information from different senses to create our perceptions. The ability also “underscores that what we normally perceive of as sight is really as much a function of our brains as our eyes,” says first author Kevin Dieter, a postdoctoral fellow in psychology at Vanderbilt University. For most people, this ability to see self-motion in darkness probably is learned, the authors conclude. “We get such reliable exposure to the sight of our own hand moving that our brains learn to predict the expected moving image even without actual visual input,” says Dieter. Although seeing one’s hand move in the dark may seem simple, the experimental challenge in this study was to measure objectively a perception that is, at its core, subjective. That hurdle at first stumped Tadin and his postdoctoral advisor at Vanderbilt, Randolph Blake, after they initially stumbled upon the puzzling observation in 2005. “While the phenomenon looked real to us, how could we determine if other people were really seeing their own moving hand rather than just telling us what they thought we wanted to hear?” asks Blake, professor of psychology at Vanderbilt and a co-author on the paper. Years later, Dieter, at the time a doctoral student working in Tadin’s lab, helped devise several experiments to probe the sight-without-light mystery. For starters, the researchers set up false expectations. In one scenario, they led subjects to expect to see “motion under low lighting conditions” with blindfolds that appeared to have tiny holes in them. In a second set-up, the same participants had similar blindfolds without the “holes” and were led to believe they would see nothing. In both set ups, the blindfolds were, in fact, equally effective at blocking out all light. A third experiment consisted of the experimenter waving his hand in front of the blindfolded subject. Ultimately, participants were fitted with a computerized eye tracker in total darkness to confirm whether self-reported perceptions of movement lined up with objective measures. The researchers enlisted individuals from Rochester; Nashville; Fenton, Michigan; and Seoul, South Korea, but, in a lucky coincidence, one synesthete could not have been closer. At the time, Lindsay Bronnenkant was working as a lab technician for co-author David Knill, a professor of brain and cognitive sciences at Rochester. Bronnenkant was not atypical in that respect. Across all types of participants, about half detected the motion of their own hand and they did so consistently, despite the expectations created with the faux holes. And very few subjects saw motion when the experimenter waved his hand, underscoring the importance of self-motion in this visual experience. As measured by the eye-tracker, subjects who reported seeing motion were also able to smoothly track the motion of their hand in darkness more accurately than those who reported no visual sensation—46 percent versus 20 percent of the time. Reports of the strength of visual images varied widely among participants, but synesthetes were strikingly better at not just seeing movement, but also experiencing clear visual form. 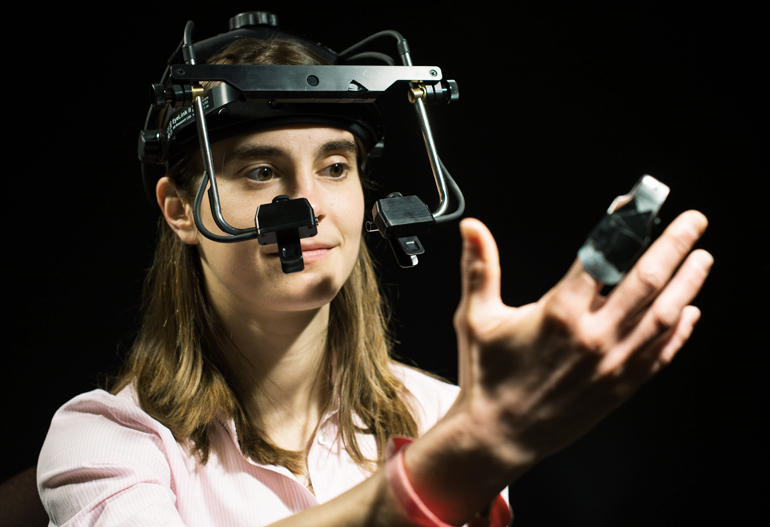 As an extreme example in the eye-tracking experiment, one synesthete exhibited near perfect smooth eye movement—95 percent accuracy—as she followed her hand in darkness. In other words, she could track her hand in total darkness as well as if the lights were on. Bo Hu, a postdoctoral student at Rochester, also contributed to this study, which appears in Psychological Science. The National Institutes of Health and the World Class University Program through the Korea Science and Engineering Foundation, funded by the Ministry of Education, Science and Technology, supported the research.